Many who are but superficially familiar with the low herbage of the fields hesitate to name as grass such large plants as Indian Rice, and attempt to solve the question by calling them reeds. But reed or grass, it is the same, and grass like characteristics are constant whether measured by inches or disguised by a gigantic growth. 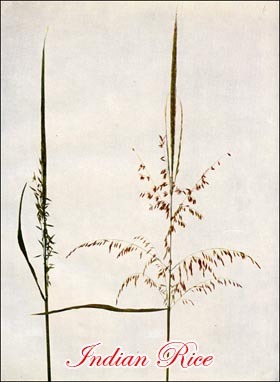 In shallow water and on muddy shores the Indian Rice grows, a tall, stout grass whose long flowering heads seem like a combination of flowers from two dissimilar plants; the upper, fruitbearing portion of the panicle consisting of narrow, erect branches with long-awned flowers, while below them awnless, staminate flowers droop from branches that are widely spreading. The dark seeds are half an inch or more in length, and where the grass grows by lakes in Minnesota and the Northwest the Indians paddle their canoes among thickets of Indian Rice and beat off the grain, gathering it as a cherished article of food, while in the water hungry fishes eagerly eat the scattered seed. On the Jersey marshes, and southward by tidal waters of the Middle States, multitudes of bobolinks in sober dress stop, during their journey toward warmth and sunshine, and find bountiful fare spread for them on ripening panicles of this grass. The bobolink's flood of melody poured over June fields is lost in autumn, and name as well as plumage is changed; ricebird, or reedbird, is the sobriquet under which he travels. These birds are, alas! a favourite target for fall sportsmen, and it may be remembered that the charm bag of Brer Rabbit carried "one ricebud bill." Indian Rice. Wild Rice. Reeds. Zizania palustris L.
Stem 3-10 ft. tall smooth stout, erect. Sheaths loose. Ligule about 3" long. Leaves 1-3 ft. long, 3"-16" wide. Panicle 1-2 ft. long, pyramidal. Spikelets 1-flowered. Scales 2. The upper portion of panicle consists of erect branches bearing narrow pistillate spikelets 4"-12" long; outer scale bearing a rough awn 1'-2' long; the lower portion of panicle consists of widely spreading branches bearing staminate, awnless spikelets 3"-6" long. Stamens 6. Grain about 6" long. Swamps and borders of streams. June to October. New Brunswick to Manitoba, south to Florida and Texas.